Recently Tesla increased supercharging prices while Shell has partnered with Greenlots to offer EV charging at Shell Stations. These are moves to profit on the upcoming revolution in powering vehicles. There is profit in DC fast charging because the country needs additional Superchargers and DC fast chargers as the fleet of electric vehicles grows. Although after the initial growth phase of fast chargers this fast charging profit will be limited by common motorist not oil elitist. (Also see why Toyota suddenly partnered with Panasonic on EV batteries). Why will the new “energy” pump become such a disruption? The disruptive weapon will become small home and business charging. Common motorist will limit the profit of DC fast charging by simply choosing to charge more at home, and or share charging with friends, families, and small businesses who want your business by allowing free charging. Apps such as PlugShare increase the ability to easily peer-to-peer charge. Everyone loves free, hence why more commuters at Tesla superchargers are older Tesla models with free supercharging. As free disappear at the superchargers and DC fast chargers increase prices motorist will counter with free home charging. For the most part no one places a gas or diesel fuel pump in their garage. No most motorist can have unlimited and free energy (after the initial investment) for the life of their home. After a $4500, 3000-watt solar system investment, motorist will have unlimited free energy fueling of electric cars. This will severely limit and hamper the ability of traditional gas fueling stations to convert to DC fast charging and charge an exorbitant amount of kWh for energy. This is a great disruption because it puts power from the hands of oil elitist into the power for the common motorist with free unlimited energy. Once motorist realize the potential savings over 20 years, upwards of $60K in fuel alone. The shift in demand for housing types and prices could change. Motorist could shift the demand for apartment and condo living to single family homes. In turn decreasing apartment values and increasing the demand for townhomes and traditional homes with built in fueling capability. Having a garage with built in free fueling capability could become the largest motorist commodity. Tesla, Shell, Greenlots, and Walgreens do not sponsor or endorse this article. I disagree with this article about 5 years period. Maybe in the next 10-15 years if not longer. The main issue that will hold EV back is 1) time it takes to charge. only around 50% of all Americans own a house that number includes condominium and apartments. Both condo and apartment will have hard time charging at the house because of how meters are currently set up for common area. Also lets not forget about people that rent. Yes some gas station might close but majority will not see much difference in their operation anytime soon. Most gas stations don't make much money on gas. They have most of the profit on the stuff inside. And EV's are a great opportunity can do a lot with people that have to be there for 30 minutes to over an hour. Nope, it seems to like a chance to make a lot of money. At this point I’d like to see real electric grid infrastructure enhancements to pave the way for the future. Public fueling for personal transportation will contract, but it won't disappear completely. Though businesses will likely add chargers to lure customers, people traveling in EVs will favor the same types of travel stops ICE vehicle owners do today. The reason is that prioritizing stops where the primary service is refueling ensures faster, lower stress trips. The 10 to 15 minute refueling of future EVs matches well with the convenience store format of current gas stations. 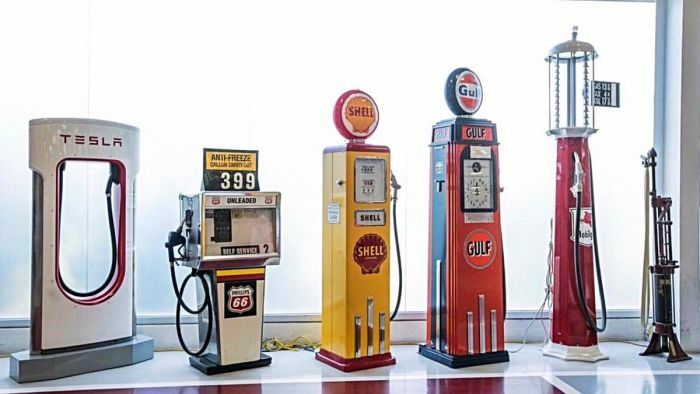 Essentially, in my opinion, urban and suburban gas stations will disappear completely, but we'll continue to see a similar number of gas stations on travel corridors -- only instead of gasoline, they will sell electricity that they mostly produce onsite. GAs stations are where the Level 3 public DC fast chargers are being installed . And you are not going to recharge yor electric car using solar panels they only produce power when your car is not at home. and even when they are a solar roof cannot produce enough power for recharging at level 2 rates. Actually Several areas like Georgia are installing Solar powered rest area car charger systems. They just need to add solar battery storage. I charge my cars from my home solar system. We generate more than enough power to charge a car at 3.3kWh and still have enough power to run most all the appliances when needed. Our home system is about 5.5kWh and we get about 4.6 kW from it. No reason we cannot expand on those efforts. For the cost of one oil well in the North Sea that last 10 years we could install 10,000 solar powered rest area charges that last 50 years, Just saying, we need to prioritize. Rich billionaries first or the general public charging cars first? America is an oil company with an army. This is excellent news. There are 150,000 gas stations in America and they use as much power as 4 million homes. It take a lot of power to keep those gas pumps pumping, those hto dogs hot and those cold beer cold. There are 129 million homes in America. Refining gasoline is the number one manufacturing process for consuming energy in America. Concrete and petrochemicals are second and third. Do you now how much energy a 480 volt oil well pump uses at 100Amps every year just to get crude oil out of the ground? A whole lot. There are over 100,000 oil wells in America. There are over 1,000 oil and gas well being drilled this very second in the "active rig count". Once we stop pumping and refining and transporting gasoline everywhere we will have so much surplus electricity we should be able to charge everyone's car for free. I hope that in the future we can change the way people think. Now people think paycheck to paycheck. They want a gas car that goes 300 to 400 miles so they only have to buy gas once every 2 weeks on payday. With Electric vehicles you only need 30 to 40 miles of range since you plug it in every night to charge, it only takes 2 seconds, and the next day it is ready to go again. People with commutes less than 40 miles will be able to charge overnight using standard 120v outlets. IF your commute is over 40 miles, then you can install any number of 240v charging units that range from 3.3 to 7.6 kWh. The electric grid also has a lot of surplus power overnight. I get a discount from my utility company to charge overnight. They have a lot of extra nuclear power I guess. So basically I drive for free and it didn't raise my electric bill. Since we changed how we shower and wash clothes and dishes etc. we actually save on our electric bill. The Tesla Kettleman california super charger is the way all will be soon. It has 40 of the 120 kW Super Chargers and 2 of the 10 kW destination chargers. They also have Solar PV over all of them for power and shade. They have large battery Power Packs . It has a center to go in and get food, drinks, use the internet and a bathroom. While I applaud the optimism of the author, I think that 5 years is more than ambitious to see such an effect happen. It does highlight the fact that if the electricity consumption doubles from charging electric cars it is uncertain that the utilities can handle it. I do not think that solar car charging will be anywhere near quick enough to satisfy external use, and the cost of installing such a system would be too high to make sense. Plus depending on where you are located and what the weather is like a solar setup might not even charge one car for the day's driving. The petroleum distribution network is well established, and rather than shut down any stations they can just lower the price of gas enough to squeeze out any electrical competition. Currently, EV cars are no real threat to the oil industry with less than 1% of cars needing public charging, but I do like the idea that with a growing EV population, people's consideration of our power usage and needs could expand our renewable energy infrastructure.